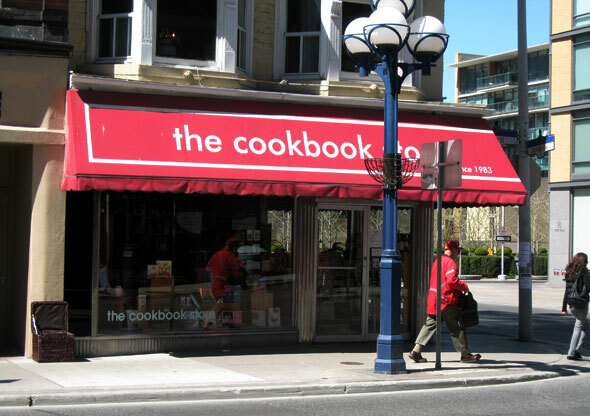 The Cookbook Store has been a Yorkville staple for 27 years. Just north of Bloor on Yonge, this cozy shop is the go-to destination for Toronto's foodies, chefs, and wannabe domestic goddesses. And since I firmly belong in the wannabe category, I'm always excited - if slightly intimidated - to enter through its door. That door has seen the "who's who" of celebrity chefs cross its threshold; Jamie Oliver, Nigella Lawson, Gordon Ramsey and Martha Stewart have all spent quality time inside. And they keep coming, as evidenced by an event schedule posted inside. The Cookbook Store should probably overwhelm, but doesn't. There's something welcoming and accessible about the warm floor-to-almost-ceiling pine shelves that border the store's perimeter and the kitchen-island-like units showcasing new arrivals. Red walls and empty wine bottles keep the shop from feeling merely literary. This is place that celebrates food. On a recent visit, store manager Alison Fryer greets me almost immediately when I enter. She's been there since the store's opening and knows every book lining its walls. As I wander around on my own, I'm more than aware that she can help me find exactly what I'm looking for. The only problem is that I don't know what I'm looking for. I'm like a kid in a candy store - a candy store that expects me to make my own candy. The impressive collection is hardly snobbish; cookbooks are easy to find, categorized by cuisine, dietary preference, food and meal type, etc. Under "American", you'll find food-authority Anthony Bourdain's tomes next to blogging superstar Ree Drummond's The Pioneer Woman Cooks, which sits only books away from The Food Network's Ace of Cakes hardcover that could double as a coffee-table accessory. Pop-culture references, most notably a Meryl Streep-inspired Julia Childs resurgence, find their places among professional-chef references and beginners' guides. Raw vegans and cupcake-lovers alike - or those who fit in both categories - will not walk away disappointed; this store is for everyone. The food literature section, marked by a colorful vegetable-patterned chair, encourages readers to curl up with a books that make them think about food rather than just make it; the wine section promises to teach me how to buy and pair wines like a pro. 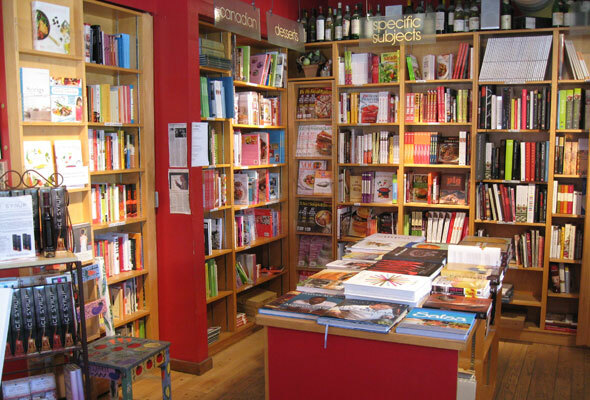 Food and entertaining magazines, kitschy aprons and select greeting cards make The Cookbook Store a one-stop gift shop for housewarming parties and the like. I make a mental note that their "Cooking with Kids" section will be worth revisiting when my cooking-obsessed girlfriends start reproducing. A sold-out food-styling tutorial and seminar is scheduled for the night after my visit; a knife skills class is advertised for the not-too-distant future. 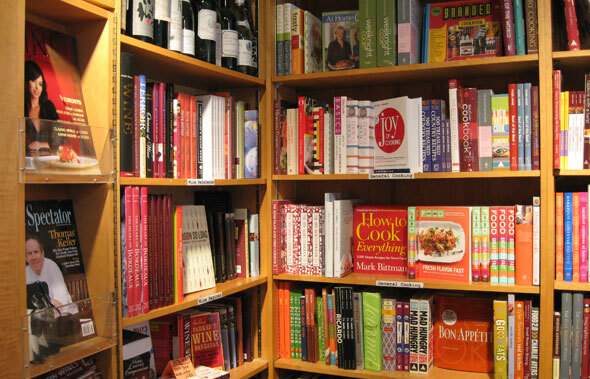 The Cookbook Store isn't just about the theory of cooking; it promotes the hands-on experience. And the enthusiasm is contagious. Someone, quick, hand me a cleaver! I leave empty-handed, but with plans to return once I've narrowed down my cookbook crushes: Mastering the Art of French Cooking? Jamie's Food Revolution? I'm also trying to determine who of my friends will most appreciate the delightful Mary Jane's Hash Brownies, Hot Pot, and Other Marijuana Munchies.